Ant baits and non-repellent insecticide sprays are two popular methods for household ant control. Baiting and insecticide spray can be combined for the most effective treatment if a non-repellent spray is used. All Ant Baits: All ants require two types of food cycles to thrive. The cycles are referred to as the sweet cycle and the grease/protein cycle. There's no easy way to tell which cycle an ant requires at any given moment. Using both protein and sweet baits is the most effective method to bait ants. 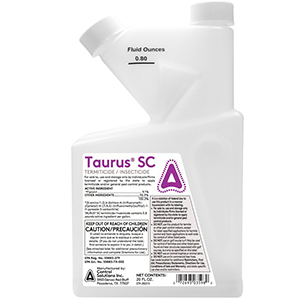 Non-Repellent Insecticide Sprays: Sprays such as Taurus SC (Fipronil 9.1%) are preferred for ant control. The ants cannot detect its presence and crawl through the treated area. The insecticide kills the ant slowly so it has plenty of time to track the insecticide back to the nest. Insect first to determine sites of nests.Use Taurus SC around the perimeter if they are foraging inside. Use Maxforce Carpenter Ant Bait and Advance 375A baits on their ant trails (inspect their trails at sunset or night when they are returning to their nests.) Use an insecticide dust like D-Fense Dust or an aerosol like Alpine PT or Alpine Ant and Termite Foam to treat void directly. Carpenter Ant Baits: Our recommended Carpenter Ant Baits will help you narrow your search. Mega-Colony Ants like Argentine Ants and Crazy Ants are persistent ants. 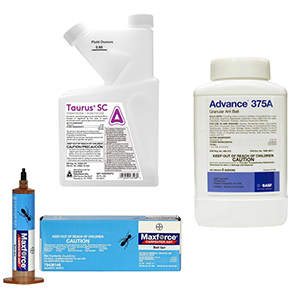 The Mega Colony Kit contains a mixture of products for your best solution. Preventive Fire Ant Control: Preventive treatment with Bifen LP granules is the easiest method to control fire ant populations. Existing Fire Ant Infestation: If fire ants have already infested an area, then a fire ant bait is required to get rid of the infestation. When it comes to controlling ants in the home, insecticide dusts are the forgotten hero. We typically focus on quick kill insecticides and baits that can be taken back to the colony, but dusts are a great long term strategy. Dust formulations have been around for years. They are safe, extremely long lasting, and easy to use. One draw back to dusts is that they take longer to kill off the colony and they aren't good to use out in the open. Dust is more appropriate for places like wall voids, and other protected hiding places. In properly protected places, insecticide dust can make an area uninhabitable by insects for years. Use an insecticide duster during the dust application to make the job much easier. Not Sure What to Get? 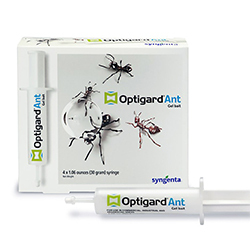 Use our Ant Type filter to help narrow down your search or see our Ant Control Recommendations From Licensed Exterminators to help find exactly what you need.